Classic car auctioneers Coys achieved some outstanding results at their inaugural auction at the IAA Frankfurt Motor Show on Saturday 26th September, with a fabulous and varied selection of classic and sports cars. 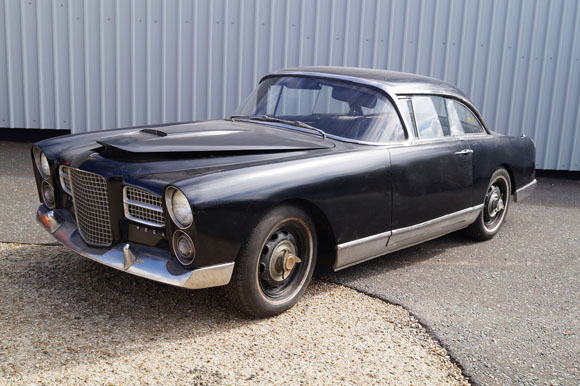 One of the highlights of the auction was a 1959 Facel Vega HK 500 (top), supplied new in 1959 to one of Hollywood's golden era most famous leading actresses Ava Gardner. This iconic celebrity car sold for €103,685. Porsches had an outstanding performance at their home country with a 1989 Porsche 930 Turbo SE Flachbau selling for €90,000, a 1994 Porsche 964 Speedster for €123,500 and a 1956 Porsche 356 A 1600 Speedster by Reutter for €232,370. Other important results included a 1966 Maserati Quattroporte I, which sold for €64,520, a 1961 Jaguar E-Type Series 1 3.8 Litre Roadster for €130,000, a 1984 Aston Martin V8 Volante for €122,000, a 1968 Mercedes-Benz 600 Pullman for €182,015 a 1965 Mercedes-Benz 600 for €81,305 and a 1994 Ferrari 512 TR for €154,040. Coys next auction is The Spirit of Motoring, held at the seat of the British sporting establishment, Ascot Racecourse in Berkshire.